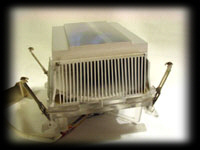 The heatsink being brought to the test bench for this review traveled through many hands to reach BigBruin.Com. 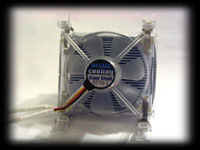 Manufactured by Arctic Cooling, distributed in the US by Scythe USA, and sold to retail customers / made available for this review by Quiet PC. Quiet PC is an international company focused on, believe it or not, selling quiet components for your personal computer. 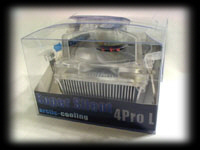 The Arctic Cooling 4Pro L Pentium 4 heatsink provided for this review is one of the newer, and more interesting, cooling solutions to hit their virtual shelves. The 4Pro L is sold in the simple, but stylish, clear cube packaging shown below. The potential purchaser gets a good look at the product about to be bought, as well as a glimpse of some of the key features and specifications by reading the various panels. Before you get it out of the box, you can see that this thing is different, and once you have it in your hands it obvious that this isn’t a generic heatsink. 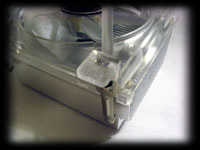 The fan features a unique design where the hub is suspended above the blades, and supported by 4 thin supports leading to a low profile frame (see images below). The 7 blades on the fan are exposed, leaving the user vulnerable to injury, but more importantly (to the enthusiast), this design will reduce noise associated with air flow restrictions. 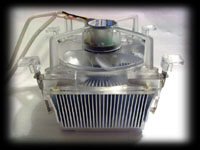 The entire fan is constructed of translucent plastic, which looks sharp, and allows the blue LEDs embedded in the fan hub to illuminate the entire device. 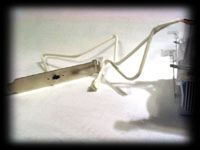 As seen in the above right image, even the mounting clips have a unique design, and continue the theme with the translucent plastic. Each corner of the heatsink is secured to the mounting bracket by a clip that is free to pivot and flex on its own. The design looks robust, and seems like it should be easy to operate. 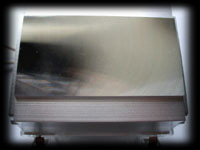 The heatsink itself is one solid block of aluminum with fins rising from a substantial base (shown upside down in the below left image). The heatsink base is machined to have a step on either side, and the surface that mounts to the processor core is shown close up in the below right image. The surface is very flat, but not particularly smooth. You can see the machining swirls in the picture, and dragging a finger nail over the surface reveals all of the ridges quite well. What really surprised me about the base is that it is not copper! The version of this heatsink intended for use on AMD processors features a copper base, and the benefits definitely seem worth the extra money it may take. 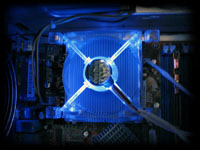 The images below provide a look at the rest of the items provided with the Artic Cooling 4Pro L... 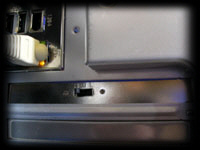 The below left image shows the 3 position fan speed controller which mounts into a free PCI slot. Notice that the wires leading from the heatsink to the controller, as well as the power leads, are sheathed in white. Definitely a nice touch, which adds to the aesthetic appeal of this heatsink. If these things were judged on their appearance alone, we would have a definite winner, and I’m hoping it cools as good as it looks. 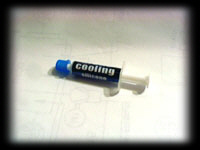 The below middle image shows two case badge stickers provided with the cooler, and the below right image shows a syringe of white thermal paste included. In case you prefer your flows to be in units of cubic feet per minute, let me help... 42.7/54.8/65.9 m3/h converts to 25.1/32.3/38.8 cfm (thanks to Convert by Josh Madison). According to the published specs, this device can move more air and produce less noise than two heatsinks pitted against each other in a review here... I definitely like that possibility, but testing will set the record straight. 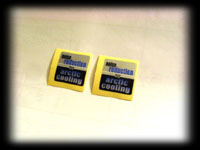 The unique clips found on the Arctic Cooling 4Pro L made installation fairly easy. I was initially concerned that I might be putting too much pressure on the clips, or that the load might be unbalance as I clipped one side in at a time, but there were no issues. Once popped into place, the fit was snug, and solid contact was being made between the CPU and cooler to ensure that heat could transfer efficiently. 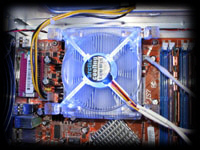 The PCI bracket fan controller fits easily into an available slot, and there is plenty of lead length to use it any slot of a standard ATX case.